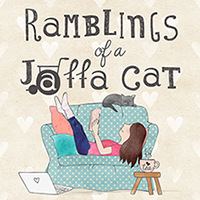 Ramblings of a Jaffa Cat: What's in my Hospital Bag? Since I’ve been reading blogs I’ve seen quite a few bloggers talking about what they carry around in their handbag, which I always enjoy reading – it must be the nosey parker in me! As I’ve had a fair few hospital admissions, I thought I’d mix things up a bit and show you my hospital essentials. It’s taken me a while to learn what I need while in hospital, but after a couple of admissions you soon start to realise what you need to keep you sane! Hopefully you won’t be needing to use this advice too much, but if you are ever admitted I’d definitely recommend packing some of the products I’m about to talk about! The first vital task for deciding what to take with you is to choose an appropriate bag. You need something that will accommodate everything you need to take, but that’s not too large, as storage is generally very limited (i.e. one small bedside cabinet) and ward staff aren’t keen on you leaving things on the floor around your bed! The bag I normally take is this weekend bag from Primark, as it’s big enough to fit what I need in it and fits nicely in the bedside storage area. I’ve had this particular bag for years, but if you head to Primark I’m sure you’ll find something similar as I often see this style of bag when I’m in there. You’ll also definitely want to take your own wash bag with you – it’s amazing what a difference it makes to have your own toiletries. Hospitals do tend to hand out toiletries if you don’t have your own, but obviously they’re fairly basic and may not suit your individual needs. You’re not going to want to fill it with masses of make-up or anything, but just pop in the essentials like a toothbrush and toothpaste and any other products you use as part of your daily routine. I’d also recommend packing some mouthwash, as if you’re nil-by-mouth or taking some types of medication your mouth can feel very dry and not taste particularly nice. My wash bag was a gift from some friends and similar designs can be found at Cath Kidston for around £28. The next few toiletries I couldn’t be without on a hospital admission – they’re real lifesavers! If you’re feeling pretty unwell, it’s not always possible to just jump in the shower and have a wash, so I always make sure I have a packet of baby wipes/make-up wipes with me. Obviously it’s not the same as having a proper wash, but sometimes it can be enough to freshen yourself up a bit. At the moment I’m using these wipes from the Simple range, as they’re very gentle on your skin, which might be more sensitive if you’re unwell. Hospital environments are well known for being hot and stuffy, drying your skin out something rotten. I always make sure I’m well stocked up on various moisturisers to try and stave off dry, itchy skin. I’ll take my Johnsons facial moisturiser, a nice rich hand cream like this one from The Body Shop and a lip balm – either from Nivea or Carmex. For when you’re feeling well enough, make sure you’ve got your own shampoo and conditioner, as from experience, hospital hair products don’t do your hair any favours! It might be worth investing in some dry shampoo, that you can use from the comfort of your own bed. Also pop your hairbrush in – I’ve found that even if I’m not feeling up to brushing my hair, it can be nice to have someone else do it for you. A few times now I’ve forgotten my hairbrush and quickly end up looking like a mad scientist! I would definitely recommend bringing your own clothes and nightclothes with you – hospital gowns are pretty depressing and generally don’t protect your modesty, having a massive opening at the back, so every time you get up for the loo you end up mooning the whole ward! If you have a nightie you might prefer that to pyjamas as it’s looser, but if you go for PJ’s I’d go for fairly loose fitting ones, as it tends to get pretty hot and if you’ve got any stitches or anything you don’t want tight clothes rubbing them. You can also take your own day clothes to wear if you’d like to. I must admit I tend to stay in my pyjamas, but depending what you’re in for you might prefer to get changed in the morning and sit out in normal clothes (again, I tend to favour loose fitting clothes). Hospitals have a pretty fair reputation of being a place where you don’t often get a good night’s sleep – with other patients and staff making noise, lights being turned on and off and various machines making random noises. You’re probably never going to get a great night’s sleep there, but there are some things you can take to improve it. Earplugs are a definite must – I’ve spoken to so many people who have been in hospital and earplugs are one of the first things they recommend! I also like to take and eye mask with me, which helps if lights keep being turned on throughout the night, or if you want to sleep during the day. You want to feel as comfortable as possible during your stay, so make sure you have your own bits and bobs around you. I always make sure I take a pair of slippers with me – if only to avoid the ‘fashionable’ slipper socks the hospital makes you wear! It can also be nice to have a blanket from home, but you’d need to check with the ward staff about this, as I know some places won’t let you bring things like that for infection control reasons. Lastly, hospitals are pretty boring places. You spend most of your time waiting for things to happen – the doctors to come and see you, a scanner to be ready or test results to come back. You need to take things with you to keep you occupied while you’re waiting! Books and magazines are always a good option, depending on what your concentration is like (I tend to favour magazines as they’re easier to dip in and out of). I was always under the impression that phones were not allowed in hospitals, but rules seem to have changed and now in most wards they have no problems with you using your phone, as long as it’s not disturbing other patients. This means you could also take your tablet in – my local hospital has free Wi-Fi, so it’s worth looking into. And don’t do what I always do and forget your chargers! Have you ever had a hospital stay? Is there anything you’d add to this list of hospital bag essentials? I'm not old enough to have a baby yet but I love reading these kind of posts! Makes me excited for the future! Good luck! Thank you Hun :) Sadly wasn't in hospital to have a baby, but hopefully I'll be very well prepared if that time comes! Ah yes, I know all too well about being wheeled round hospitals in cringey pyjamas! It's generally been on my unplanned admissions when my Mum's just brought in what she thinks I'll be comfy in, bless her :) Bunny slippers are pretty awesome though!